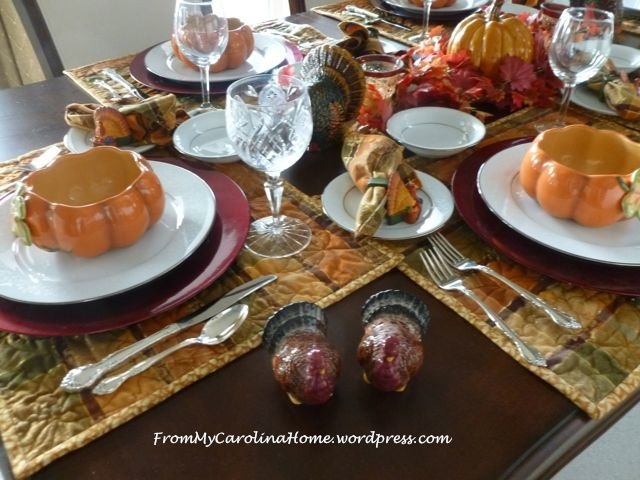 It is a wonderful time of year for setting a beautiful table. Maybe it is just me, but I like mixing things together to create a work of art for the table. One thing that always bugs me is centerpieces that are too tall. I like to have a low decoration down the middle of the table. It is to be enjoyed as you are seated and are eating, but isn’t in the way when you are talking to someone across the table. 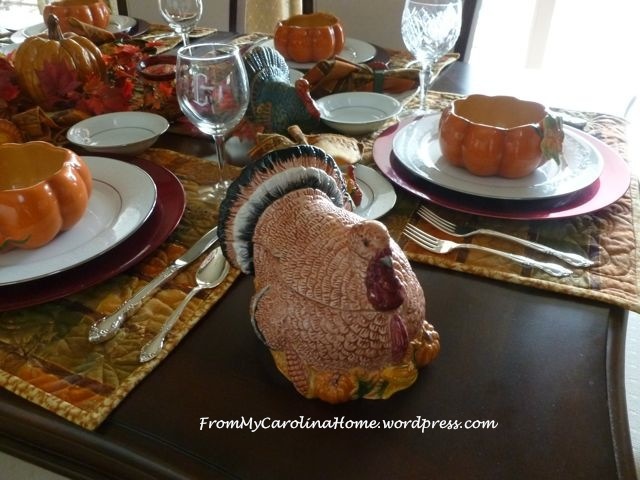 This year, I am using a pair of turkeys at each end, with crackle glass candle holders, and a large ceramic pumpkin in the center surrounded by fall leaves. 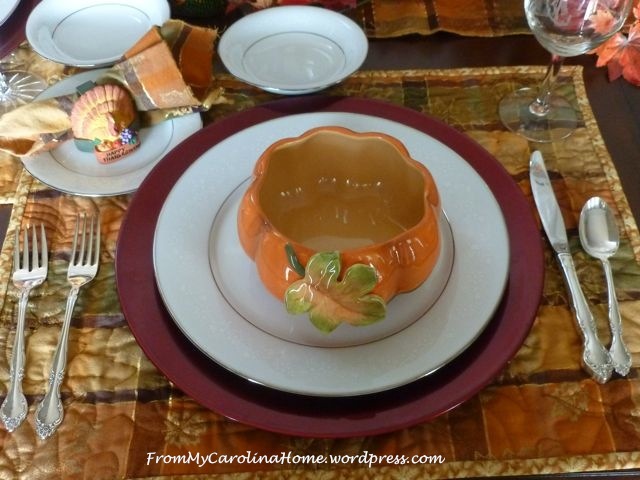 My mother always loved autumn, and she also gave wonderful dinner parties with lovely tablescapes. I think of her often as I set a table. The holiday is one of the few times I can set a formal table, and I really enjoy it. The cranberry red chargers were her idea years ago, and we both had them. 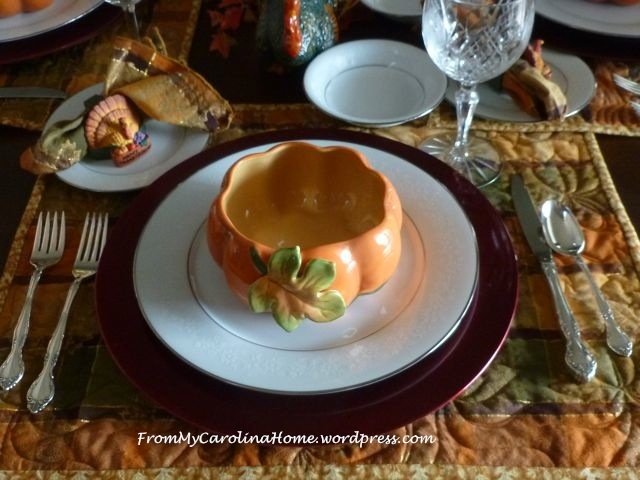 I love those pumpkin bowls too, perfect for a soup starter or a salad for any meal during the harvest season. I made the placemats a couple of years ago. I got this beautiful fabric in a secret stitcher exchange. That is so fun, to send fabrics and little goodies to someone you have never met and get a surprise in the mail from someone else you’ve never met. I quilted these up with the same fabric on both sides using a pantograph called Maple Dance. There was enough fabric to have napkins too. I have a collection of ceramic turkeys, and they are scattered all over the place in November. Every year they roost in a different spot. This one is special. It is a gravy server I bought years ago. My mother asked to borrow it that year as she was hosting. She never gave it back. It became a joke between us that the turkey loved her house more than mine. It came out and was used every year, but no matter what, it always seemed to get back to her house after the meal. On our table this year are the Thanksgiving napkin rings I inherited from her. They are little turkeys that say Happy Thanksgiving across the bottom. I placed them on the bread plate with the napkins. The little bowl next to them is for the cranberry sauce. I have little turkey salt and pepper shakers too. I swear I used to have four of these little guys, but I can only find two. The great thing about setting the table in advance, is you find out what needs to be done early. This year, the silver needed a bit of polishing, easy to accomplish a few days ahead rather than on that day. The bright light behind the chairs is the sunlight coming through the floor to ceiling windows looking out over wonderful fall color in the valley. What do you do for your tablescape? 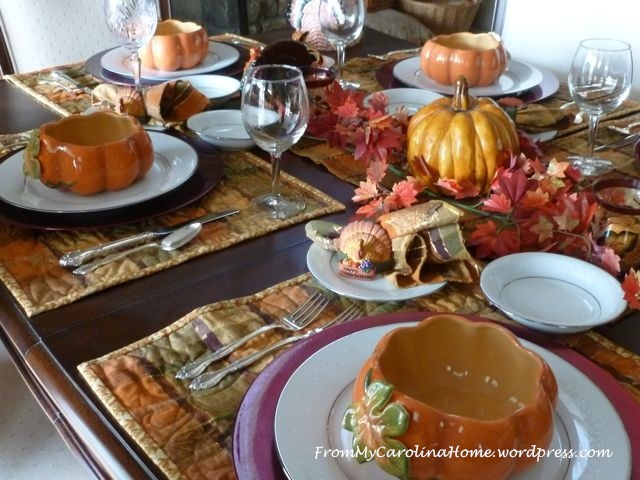 The pumpkin bowls for soup are charming. Thanks for sharing. Carole that is a beautiful table! Very festive! I like you love to decorate for the holidays. Can’t wait to see your Xmas decorations. HAPPY THANKSGIVING! Gorgeous table, but where do you put the food? 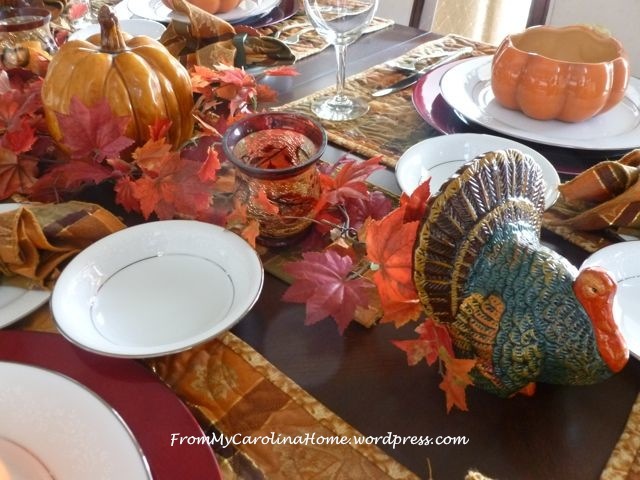 I have nothing special for Thanksgiving, even doing buffet style, there are still rolls, butter, glasses, cranberry sauce and other condiments on the main table, never have really had room at big family meals for centerpieces, sigh! So I use the good dishes, the good salt and pepper shakers, the gravy boat gets a place off the display shelf and on the table… but Thanksgiving is our last true holy-day, we give thanks for our friends and family, and the abundance God has blessed us with, in whatever amounts. I hate it to be called turkey day, I always politely correct that phrase! You are stressing me out! I haven’t planned my table setting yet! I think I need to make a run to a craft store for some add ins. Are your leaves loose or is it a garland? We serve buffet style, so there is no excuse for not having something besides the usual candle setting. Thanks for sharing! 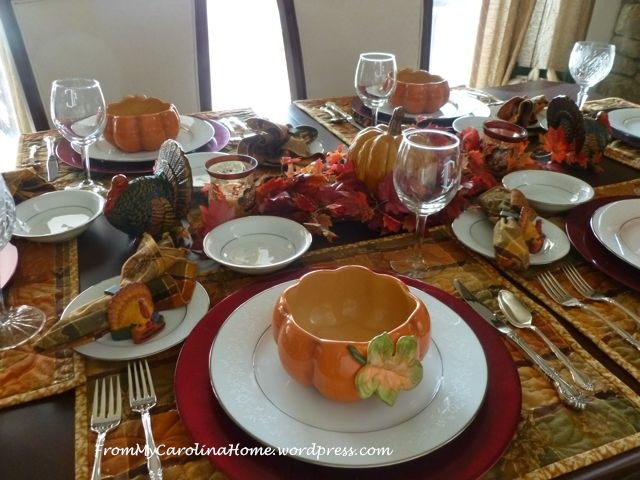 What a terrific Thanksgiving tablescape! I agree with LOW centerpieces and always try to keep that in mind. 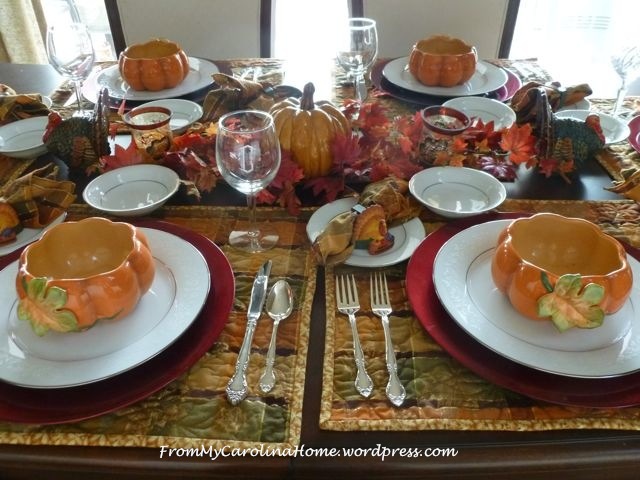 You have so many beautiful pieces and accessories for your table but my fave are those pumpkin bowls! We’ve already celebrated Thanksgiving here in Canada but I’m wishing you a terrific one there on Thursday!